Wonderworld Soft Play in Kinning Park is one of our other second homes (after the science centre & the park). It’s where we go if we’re at a loose end. In fact, it’s probably my favourite soft play area in Glasgow. We were back a few days ago and I realised I have never written about it. (I was sure I had. Baby brain strikes again). It’s huge. Seriously. Last week we ended up in a bit we’ve never been in before. And we’ve been here, a lot. 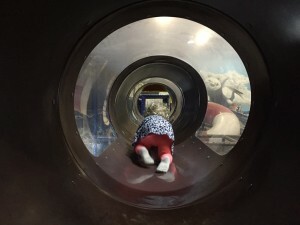 The main play frame has at least 3 big, fast slides (one of which is almost vertical) plus those twisty tunnel slides that it’s impossible to get down with a toddler. There’s a big area to run around in over 3 levels, a bunch of trampolines, foam ball shooters, bridges & probably loads other stuff that we haven’t found yet. 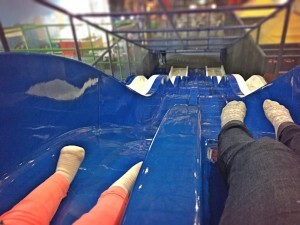 The slides in the main area are too fast & too big for the little lady to go by herself yet (as are the other children). The toddler area is one of the best we’ve played in. It’s big enough for the little lady (who’s 22 months) to happily play in for a while, and she’ll go up the play frame & down the slide by herself. There’s a decent sized ball pool (big enough for a random 6ish year old to hide in & make you kack your pants when they leap out at you making zombie noises), some cars & a good bit of floor space with soft blocks etc to keep the very littles happy. There’s also a go-kart track and a football pitch. And over the other side of the massive warehouse room there’s another slide that looks like a volcano. The little lady is way too small for it, but there are kids crawling up it & rolling down it constantly. Looks fun. The food is pretty standard for soft play. But they have a Starbucks inside which is a winner for me; you can’t beat a chai tea latte. They also have a pretty good cake selection. When you walk in there’s an ocean of tables and chairs facing you. I’ve never had a problem getting a table (although we usually avoid peak times so I can’t speak for what it’s like on weekends & in really busy periods). It’s free for under 1’s at any time. It costs £4 for under 3’s & £5.50 for over 3’s off-peak. They get unlimited play. It’s a bit more expensive at peak times (£5.50 & £6.95) for 2 hrs play. It’s huge and there’s loads to keep kids (young and old) entertained. They have regular toddler mornings on Tuesday’s with entertainment which are pretty good. And like I said before, chai tea lattes. Wonderworld is at 99 Middlesex St, Glasgow, G41 1EE.